I had a great discussion with one of my virtual office mates last night (thanks @autumm). One of the things I miss the most about having regular get togethers with my PhD cohort is a chance to talk about various things of interest to the academically included. In this case, it was a discussion about the different between digital skills, digital literacies, and digital citizenship. Had we not had the conversation, I don’t think I would have as clear a vision of it. Let me explain my understanding, using blogging as an example. A digital skill is your ability to use a specific digital tool. In the case of this blog, one could say that I have the digital skill of using WordPress – or more specifically, that I know how to use WordPress to write and post a blog post, update blog pages, and update blog themes. I have many more WordPress skills, these are just some examples. A digital literacy is the ability to use a digital skill and derive other concepts from it. Because I know the workings (have the skills) with one blogging platform, I can take this skill and move it to another platform (e.g. blogger). I might not know exactly how to do something in blogger, but I know what can be done, and I know the language that is used within the tool (e.g. the difference between a page and a post, what a theme controls, what it means to moderate comments). The understanding of how to use a specific tool well enough to use a different ‘flavor’ of the same tool means that I have a digital literacy in blogging. Note that it doesn’t really make sense to say someone is ‘digital literate’. That would be kind of like saying someone is ‘language literate’ because they speak a language. There are so many different digital technologies out there, that someone could be very literate in one (e.g. I’m very literate when it comes to blogging) and not so literate in another (e.g. I’m not at all great at digital photo editing). Just because you know one technology doesn’t mean you know all technology. That would be akin to saying that because you speak one language, you speak all languages. Digital citizenship has more to do with using technology in responsible and appropriate ways. It is more about being a citizen in the digital world. If we take the blogging example again, it relates to the ways in which we interact within the blogosphere. For example, if I want to quote another blogger, it is customary to not just quote them but also create a hyperlink back to the specific post where the quote was made. Citizenship is more about how to effectively and ethically participate in the larger community. One might think of it as a digital literacy looks at the individuals use of a technology where digital citizenship looks at how a technology is used within a larger context – beyond the individual. Of course, this ideas are not agreed upon differences, and I’m sure there is overlap in many areas. There is no one definition, nor one way in which the ideas are used. The key for me is that when teaching technology, there is so much more than teaching which button to click. Using technology effectively is not necessarily about the interface. Teaching about technology requires exploring the larger context of technology, beyond a single tool, and beyond an individuals use of the technology. 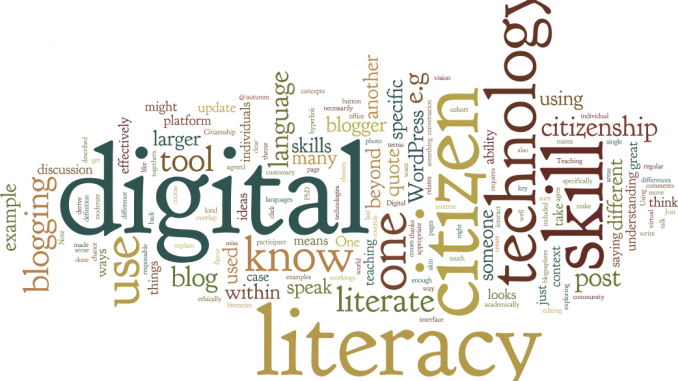 Do you agree with how I’ve described digital skill, digital literacy, and digital citizenship? How do you use the terms? I hadn’t considered the ‘skill’ – ‘literacy’ distinction before; it’s really useful. I’ll be borrowing it in future – with due credit given! For me there is another crucial element to digital literacy that derives from my disciplinary background (history) and my experience with the Liberal Arts. In short, to be truly ‘literate’ from those perspectives is to understand how context and form shape the meaning produced by ‘texts’. This translates more or less directly to critical reading of digital ‘texts’. A critical mindset is a critical mindset, whether you’re applying it to an op-ed in a newspaper or a blog-post. On the other hand, I think there is a new dimension of ‘literacy in the on-line world that comes from understanding the way digital tools and systems work to shape texts, narrative, and meaning. To borrow one of your examples, understanding the capacities of photo-editing software can (should) shape the way a literate citizen approaches digital imagery. Likewise understanding the way a search engine works ought to improve a citizen’s capacity for critical on-line research; understanding the way a social media news-feed is constructed, out to provide a more critical perspective on such services as sources of knowledge (or dare I say it, truth).